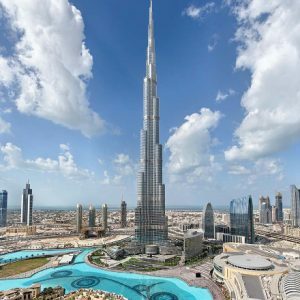 You probably have the idea that you have to adjust a lot to the culture and way of life in Dubai or the United Arab Emirates. However, usually you will notice very little differences to how you would live your life back in Europe or the US. it’s almost the same but there are differences that you will see and hear. There are plenty of mosques here and you will hear the daily prayers, but after a few months here you will not notice as much. The cultural and traditional dress is pretty unique in Dubai. But apart from that there is nothing within Dubai that you will find that is very different in terms of religion and Culture from back home. 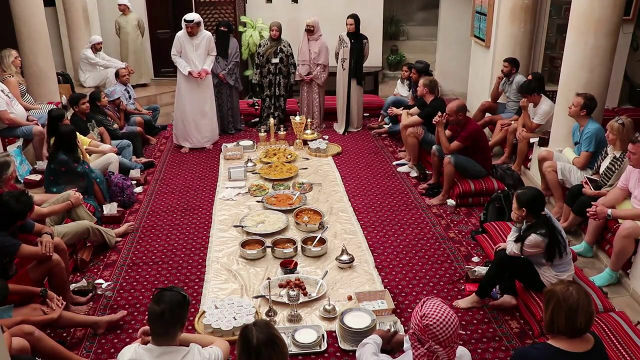 One thing that you will need to understand when you move or live in another country, whether Dubai, UAE or any country is that you have to adjust and respect the culture and religion in that country. It’s no good going with the attitude that you can go and do whatever you like the same as in your own country. You need to be very respectful of other people’s beliefs. When you are making the effort to do so you are not going to face any problems and the locals will respect you for it. In Dubai it is mostly very liberal. Everybody has a pretty open mind with dress and the locals do make allowances for you if you are a westerner. Dubai has a reputation for having a strict dress code but not as much as the rest of the UAE. But if you dress respectfully and you’re always cover down to your knees and cover your shoulders then there is no problem. That is what a lot of people are concerned about. But if you are sensible then there won’t be a problem. Diet is different. But if you cook your own food, then you should be able to buy just about everything locally the same as you would do back home. If you eat out a lot then you will have to adjust to the local food and it might take some time. But it is quite good. There is also western food available and is considered an exotic food by the locals. If you are vegetarian then you will not find any difficulty in your diet. Everything that you need is available to you locally that you would find back home. Eating out, doing grocery shopping, cooking your own meals. All of that is very easy. You will not struggle when you go out either. There are very delicious restaurants to go to that are strictly vegetarian and most restaurants will have a vegetarian option too. If you’re vegetarian don’t stress. If you are planning on moving to Dubai in the future or if you’re planning a holiday to Dubai then you are in good luck with this. There is so much available you could do a quick Google Search and find restaurants in Dubai that specifically cater for vegetarians you will not have a bad experience. 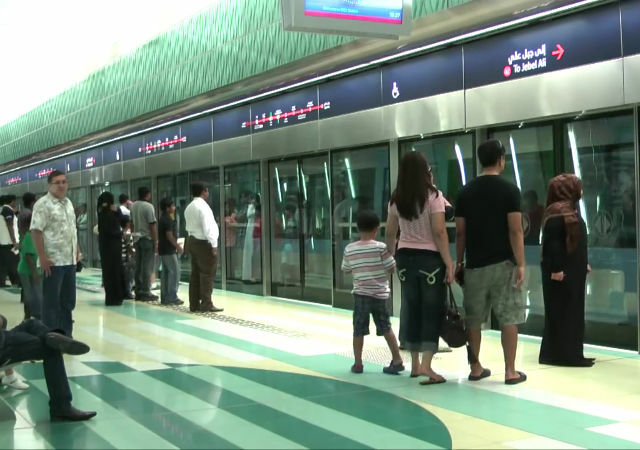 The transport system in Dubai is pretty good. You don’t need to rent or own a car in Dubai. The public transport in Dubai is pretty good. They have a bus system which is good for some journeys but you will find that you will be using the metro system all the time. The metro system is excellent. It runs every 3 to 6 minutes. There are just two lines at the moment but they’re working on more lines in the near future. It is very cheap for getting to work or going out or going shopping. The next way to get around is by taxi, which is usually cheaper than what you will find back home. The firm that you work for may provide company transport but only for getting to and from work. There are loads of taxis in Dubai and they are very affordable compared to back home. Taxis in general and living expenses in Dubai are very cheap. But if you go everywhere by taxi it will soon build up. Living in Dubai is very affordable when you get to know where to buy things and where to go. In terms of getting around taxis is the transport of choice because they are so cheap meaning there is no need for you to buy a car. There are many enjoyable things to do in Dubai as a tourist to Dubai or UAE. There are a lot of touristic and popular sightseeing things to do in Dubai. One of the things that is highly recommended is of course the Burj Khalifa. This is currently the tallest building in the world. It is really impressive to go up there and have a look from the highest floor. You can go as a guest. As a guest you can look all up and down the coast. You can look in the direction of sharjah in the Emirates In the other direction you can also look up the coast towards Abu Dhabi. It too is beautiful to look at. It gives you a panoramic view of Dubai. However, it’s very high. So if you’re scared of heights you need to be prepared. Another thing that you can really enjoy seeing when you’re in Dubai is going to see the Burj Al Arab, which is a sail shaped hotel in the sea. There is no doubt that everybody has seen this but not close up. It is a really impressive really beautiful hotel. Just to see it from the outside is really spectacular and you can totally appreciate the architecture. It is something that is highly recommend that everybody goes and takes a look at. If you can go inside as well then you won’t be disappointed. One more thing to do is go to Wild Wadi Waterpark. it is so much fun. It is highly rated compared to all the water parks all around the world. It is excellent. It does not get too overcrowded. You can always get onto the rides without queuing. Make sure you go at the right month of the year to be comfortable at the Waterpark. In summer it can get very hot in there. If you’re going in the middle of summer you will get very hot even though it is a water park. So try and get there in the Winter or Spring months. 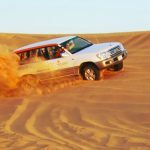 Something else that is very enjoyable to do in Dubai is desert jeep safari. It is very enjoyable. You go out on a big land cruise through the sand dunes. This is a really fun thing to do even though you might be apprehensive. In the middle of the desert you are taken to a traditional place to have a big feast of Arabic food where you select all the food that you like to eat you go and sit down all together on a really nice nice carpet. Then you enjoy some entertainment. You can have henna tattoos. You can smoke shisha pipes. You can ride camels. You can have pictures with falcons. You can have a lot of fun as a tourist as a first timer to Dubai. It is highly recommended. People think that Dubai might be dangerous specially for a woman. But even at night time if you’re alone as a woman then it is quite safe. It is generally a safe City and a safe country in general for women. It’s unknown for any problems with women going about by themselves. You shouldn’t feel that in appropriate to be out by yourself, even at night as long as you are in a public place. If you have a concern that you will feel safe when your alone out at night then always go with friends be with people that you trust and don’t go to places for the first time at night and just be really careful where you go drinking alcohol. There are some legalities over Alcohol licences. You need a licence to drink alcohol in Dubai as a resident. When you start work in Dubai you’ll be given a residence visa. You will have to purchase an alcohol licence if you wish to drink alcohol or hold alcohol in your house or apartment. So even if you don’t consume alcohol yourself if you wish to have alcohol at home you will be required to obtain an alcohol licence. It is a very simple process and costs about $150 in the local currency. You will be required to obtain a new licence every year and that will allow you to purchase, consume or hold alcohol in the UAE. If you’re just passing through Dubai on a stopover or just as a tourist for a few days you shouldn’t really need a licence. There are a lot of rumours of people being arrested for really petty things in the UAE. There are stories that do circulate within the media about people who get caught out for doing things that are totally acceptable in their own country and then they come to Dubai and whatever they did in public or whatever, it was not allowed and they were arrested. So if you are thinking of moving to the Dubai this may be of grave concern to you so. You just need to respect the Muslim culture you need to dress modestly and respectively, to respect the culture and their religion. Avoid public displays of affection. So, no holding hands. No kissing in public. Just accept it. And there’s no need to argue or labour the point with them. Don’t put up a fuss. Just accept it and just move on. Just respect it and don’t try to complain or argue the point of why they have that rule in their culture. There are many team sports that run all the year round in Dubai. especially in the winter, when you can play outdoor gym sports because of the temperature which is more bearable in the winter. There’s basketball, football, rugby and also tennis. There is a really big tennis center in Garoud in Dubai. There are also aerobics classes, Pilates classes, yoga classes. There are plenty of gyms. As well as all the mainstream gyms such as Fitness First and all the other big names. So you can join a gym and be a member and then just go when you feel like it. Most apartment buildings have a gym included. So you can keep fit and active in Dubai. It’s very easy to keep fit and keep active in Dubai because there are lots of indoor spaces and gyms and in the winter there are outdoor sports. There are beautiful beaches in Dubai. In the summertime it can be too hot. And the water can be luke warm in the winter. In the winter time it’s probably just about right. You can do power boarding, surfing, snorkeling, and diving. All of the watersports are available in a really beautiful part of the gulf coast. Healthcare system in Dubai is actually quite good. It is something that you will want to know that you have available before you move to another country. A lot of companies will provide health care insurance as part of the job by their employer. With health care cover all the private hospitals and doctors are available to you. So make sure your job includes Healthcare otherwise it will become very expensive. Because it is private your health care might be better than in your own country. Also, make sure that you have dental health care cover as well. So, just make sure that your employment contract includes Healthcare. It is worthwhile looking around for a good dental clinic that is accessible to your home or work.